No results found. Try another keyword. Stay informed of upcoming events, workshops and interesting stories! We have a fantastic opportunity for people to share stories about Scarborough Beach this February. Thanks to the MRA and City of Stirling, our travelling sound booth will be available for people to come down and record their stories for FREE! Relive Scarborough’s glorious past with your stories of the Snake Pit, Scarborough Hotel, Luna Park, fashion parades, surfing, swimming or more. Whatever your story, we’d love to hear it. Book your session now to come down and record your story – bring along your photos and we’ll edit together a short video for you to share with your family and friends. 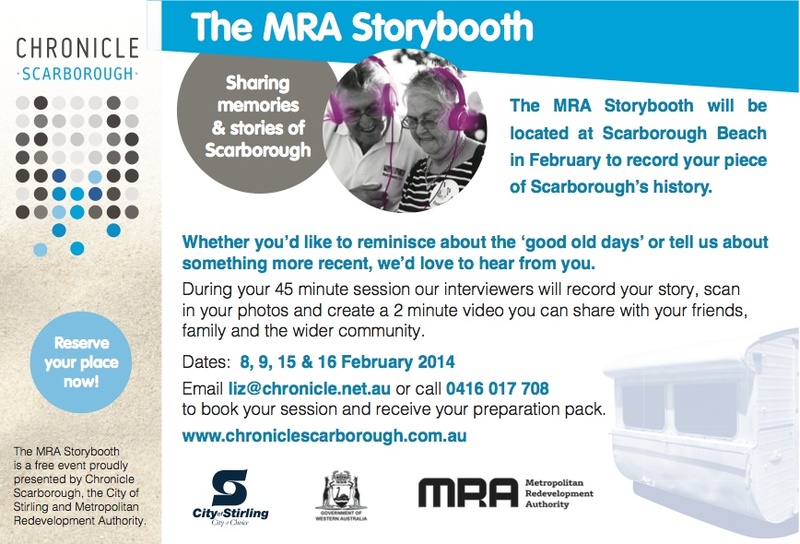 The MRA Storybooth is by appointment only and will be at Scarborough Beach on the 8th, 9th, 15th and 16th of February 2014 from 10am – 4pm. If you would like to share your story send us an email requesting an appointment (each appointment lasts approximately 45 minutes). You will be sent an interview pack to help you prepare for your session. 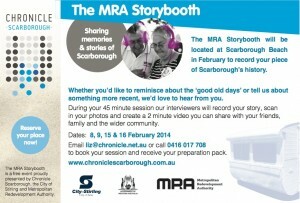 The MRA Storybooth is a free event proudly presented by Chronicle Scarborough, the City of Stirling and Metropolitan Redevelopment Authority. Chronicle is a dynamic collection of personal histories, memories and artefacts that together create a sensory experience of the past. Chronicle Scarborough is produced and developed by Storyfire with the assistance of ScreenWest and Lotterywest. The project is also made possible with in-kind support from City of Stirling. In 2016 the City of Stirling acquired the Chronicle Scarborough website including the stories and photographs. Plans are in the making to expand the Chronicle Scarborough concept to include all the suburbs within the City of Stirling’s local government area. This will ultimately build our collection of shared stories that help define us as a community. In the meantime we encourage all visitors to continue sharing their stories, memories and photographs.